SPRINGFIELD, OH--(Marketwired - February 25, 2016) - Accustomed to rows of low stacks and a vast storage area serviced by a fleet of rubber-tired loaders, yard operators once had to build and maintain literally miles of roadways to service their inventory. Woodyard managers believed that the ongoing headaches of vehicle maintenance and replacement, fluctuating fuel costs, ground compaction and fuel oil contamination were the inevitable consequences of doing business. Konecranes straight-track all-electric 20-30-ton portal crane was a complete game-changer for woodyard operation. The idea hinged on a condensed woodyard area, which eliminated the need for many of the roads and loaders. 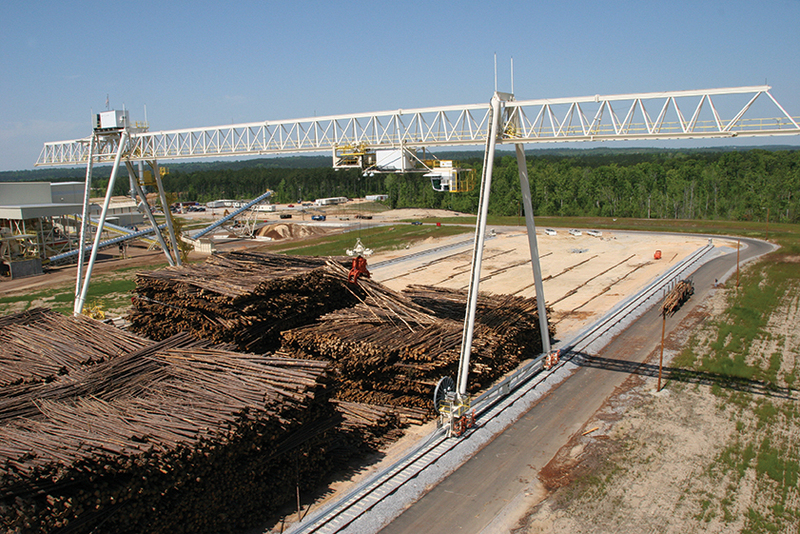 Logs could be stacked higher, which meant less breakage and better utilization of space. "First, we had to show the woodyard managers how the all-electric portal crane would achieve 95 percent or better uptime with an average operator," says Gary Otto, Product Manager, Portal Cranes for Konecranes. "Then, we needed to show the financial people that the crane had a great return on investment and a short payback, usually less than 24 months and sometimes as short as 12 months, compared to the established multiple loader concept." Benefits included lower energy cost as electricity replaced fuel oil, less maintenance cost, elimination of double handling and faster truck turnaround time. But the greatest advantage the portal crane delivered was its ability to operate in minus-40-degree temperatures. Today, Konecranes portal crane design with its lattice-work girder is seen worldwide. In addition to being cost-effective, the open design also allows for easy inspection of critical welds throughout the life of the crane. Compared to a conventional gantry, portal cranes operate on easy-to-install and maintain tie and ballast runways. This approach reduces load deflection damage and associated structural and track maintenance. As one would expect from a leader in the research and development of portal crane technology, Konecranes has continued to evolve its design to save time and make work more productive. Many of Konecranes signature load-handling and diagnostic Smart Feature technologies now come standard on Konecranes portal cranes, and customers can add others as their requirements change. In 2014, Group sales totaled EUR 2,011 million. The Group has 12,000 employees at 600 locations in 48 countries. Konecranes is listed on the NASDAQ OMX Helsinki (HEX: KCR1V).